The introduction of the Manoovr MPL semi low-loader in October 2015 was extremely successful. In just a few months more than 250 axle lines have been sold and delivered, accross many countries in Europe. 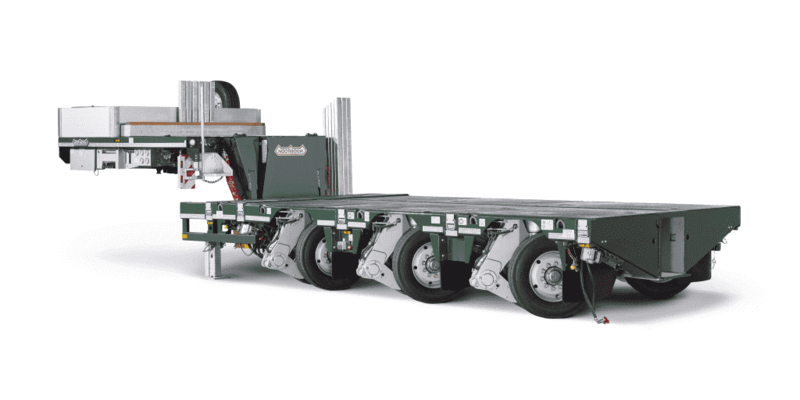 The advantages of the Manoovr are an extremely low load floor of 780mm, the high legal axle load of 12 tonnes/axle line, the generous suspension travel of 500mm, a tyre life that will last for at least 300.000 km and the favourable ‘total cost of ownership’. At the BAUMA 2016 the Manoovr with 10 axle lines and a detachable Multidolly was a world first. With a total weight of 150 tonnes at 80 km/hr this MPL-150-37(V) is up to now the largest Manoovr semi low-loader with the highest payload in the programme. The MPL with Multidolly is an excellent alternative for some modular trailers. With important advantages such as its extremely easy operation, low dead weight and a single or double extendible load floor with optional extra width extension. The steering of the rear axle assembly of the Manoovr can easily be adjusted when the floor is extended. The steering of the Multidolly can be adjusted hydraulically to ensure optimal steering behaviour in extended as well as retracted position. Whether extended or retracted, the trailer tracks the tractor perfectly and therefore tyre wear is kept to a minimum. In spite of low dead weight, extremely strong load surface suitable for extreme loading.